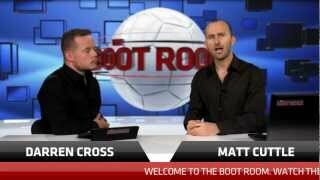 Darren Cross from Match Magazine and Matt Cuttle are back for 2013 with their Boot Room series. To kick off we have their latest 2 episodes where they teach you more about which teams to use in Seasons Mode for FIFA 13 that may give you the edge online and also teach you how to defend against different kinds of opponents. Darren explains to Matt how these non-premiership 4 Star teams, their formations and line-ups will up your game when playing FIFA 13. Learn how to defend against different kinds of opponents. Join Darren and Matt next week for more FIFA 13 tips as hey teach you how to make sure you make the most out of your scoring opportunities.